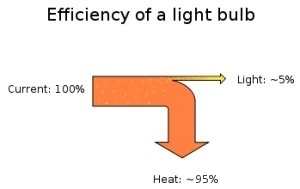 A light bulb creates not only light but also a lot of heat. Only 5% of the input energy is used for emitting light. The rest is heat. So the efficiency of a standard light bulb is very poor. Bulbs react as PTCs. That means that the resistor is very low at the first moment after switching on. For this short moment the bulb takes a much higher current than usual. That is why most of the bulbs get broken while switching on. Expensive halogen bulbs with an electronic brightness control very often also have a soft start function which limits this input surge current. The life expectancy depends on the voltage. The higher the voltage the shorter the life expectancy. Regions with many overvoltage periods will have a higher consumption of light bulbs. 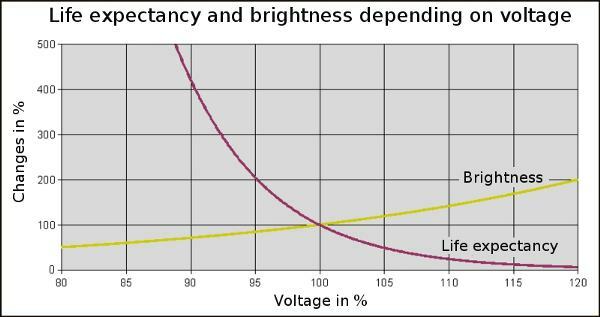 In the diagram you can see the dependence on voltage and life time. Is the voltage 100% the life expectancy also is 100% (graphs are crossing). If I increase the voltage of only 10% the life expectancy drops to 1/3 (at 110% voltage). Or if I could reduce the voltage of 10% the bulb will live 4-times longer (400% at 90% voltage). By the way the brightness of the bulb will not change very much. See the yellow graph. The advantages compare to a normal bulb are: smaller size, higher efficiency (brighter with lower wattage) and higher color temperature (light is whiter) than a normal bulb. Halogen bulbs are made in general for 6V, 12V, 24V. To run the lamps on mains a transformer is needed. A rectification is not needed because the bulbs work with AC and DC. Nowadays the industry produce also lamps for 230V direct use. Wattages of 10W, 20W, 50W and 100W are common. In medical equipment halogen lamps are used in microscopes, slit lamps, endoscopes and spectrometers. It is also possible that one can find halogen lamps in vaporizers. In this case the bulb is used as a heating element. A new bulb should not be checked with the main voltage in the shop – only with an ohm meter. Once the light bulb was hot it is sensitive for vibrations. Any surface contamination, especially fingerprints, can damage the quartz envelope when the bulb gets hot. Contaminants will create a hot spot on the bulb surface when the bulb is turned on. This extreme, localized heat causes the quartz to change which leaks gas and the bulb will be destroyed. Halogen lamps must be handled without touching the clear quartz, either by using a clean paper tissue or carefully holding the porcelain base. If the quartz is contaminated it must be cleaned with alcohol and dried before use. An additional problem could be the connecting pins. Never bend the pins. They brake easily. Because the pins are often silver-plated the pins of used and even new bulbs are very often oxidized. Clean the pins carefully with a glass fiber brush or steel wool. Do not forget to clean the bulb surface after that work. Consider to reduce the voltage of the power supply if it is possible. The life expectancy will increase, specially when you often have problems with overvoltages. A reduction from 12V to 11.4V (5%) will double the life expectancy. The loss of brightness is hardly visible.